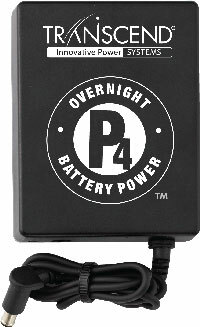 This is the P4 Single-Night battery for the Transcend CPAP system. This battery is configured to work specifically with the Transcend CPAP that is pictured here. It is not designed to be used with any other cpap devices. Note: The battery does not come with a charger. You will need to use the Transcend Universal Power Supply (AC power cord that comes with the cpap), the Transcend DC Mobile Power Adapter (DC power cord), or the Transcend Portable Solar Battery Charger to charge it.